Rosemary is native to the Mediterranean region. Since its primordial Mediterranean origins, the woodsy-citrus-like fragrance of rosemary has graced gardens and kitchens throughout the world. Rosemary, a member of the mint family lamiaceae is one of those herbs with a thousand uses, not only for cooking purposes but they are made into an oil or used in perfumes and shampoos. Rosemary is one of the most commonly found herbs in a spice rack, and for good reason ”“ it has a wonderful taste and aroma. 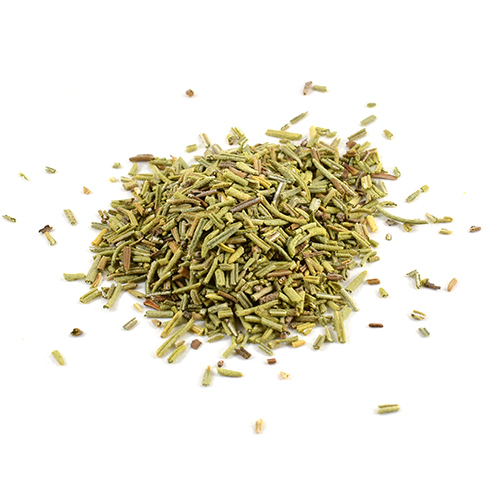 The rosemary herb is spicy and warm, and is o ften paired with rich meats such as lamb and steaks. In cooking, rosemary is used as a seasoning in a variety of dishes, such as soups, casseroles, salads, and stews. Use rosemary with chicken and other poultry and fish, especially oily fish. It also pairs well with grains, mushrooms, onions, peas, potatoes, and spinach. Rosemary is a favorite in savory cooked dishes, baked goods, and even added to desserts. Rosemary is a very popular herb in Italian cooking, in which it is often used in vegetable preparations ”“ particularly, roasted potatoes. Rosemary is great with all kinds of grilled meats and fish. Unlike many other aromatic herbs, rosemary does not lose its flavor by long cooking. Rosemary is an evergreen perennial that likes full sun and well-drained sandy soil. Plant seeds in the Spring, after it warmed up. Once your plant is established (around 6 weeks), you can harvest rosemary cuttings at any time for daily culinary use. In fact, pruning will give you full and healthy plants.